This new project has a focus on empowering migrants and refugees to speak out and seek support. Building on the findings from Birchwood Highland's 'Migrant Matters' research, this project will seek to fulfil the need for support services to be enduring, community based and community led. Immigration can have a profound physical and psychological impact on people which affects mental health and well-being. Highland Migrant and Refugee Advocacy aims to challenge the stigma around mental health and hopes to support migrants and refugees to have a voice and seek support when they need it, particularly through advocacy and peer support. It is the project's aim to develop an advocacy training package to train volunteer advocates, from migrant and refugee communities who can support a number of migrants and refugees in the Highland area. We believe that those with direct experience of migration have a particularly valuable expertise and are best suited to educate and support others. Through training volunteers from migrant and refugee communities, we hope that we can reach and support more vulnerable, yet valuable people. Over the course of the project we will develop drop-in sessions in various locations across Highland, as well as establishing community hubs where people can access support and advice. By establishing a safe space to connect, share knowledge, access information and supports to reach potential - we aim to support migrants and refugees from all backgrounds to have a vibrant voice in the Highlands. 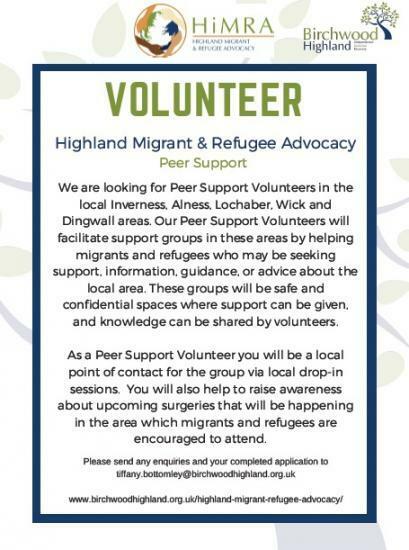 Highland Migrant and Refugee Advocacy are looking for Peer Support volunteers.